So far we have covered most actions needed to incorporate the Wolfsburg West Okrasa TSV1300 replica crank, but we still have a couple of actions left. This time it's time to lengthen the pushrod assembly to compensate the wider engine. Luckily, when buying the WW crank you get a small bags of 2.75 mm pushrod extenders along with some instructions. Getting the rods apart was fairly easy. 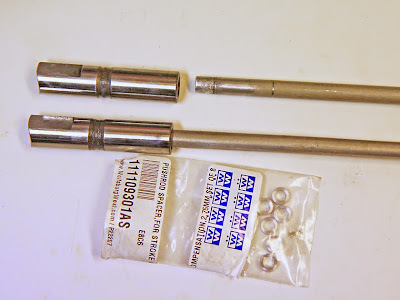 I did put them in the freezer for a while to shrink the aluminium pushrods (remember the thermal expansion of aluminium is greater than the one for steel) before carefuly prying the lifter from the rod. During reassembly I did first push the extenders into position before attempting to get the pushrod back in the lifter. Some light force was required. I found that you have to be careful in lining up the rod with the lifter. As the rod is pretty long it is easy to get them at an angle. For those of you not familiar with these old engines the pushrods did have a wooden stick inside (chop sticks). The engineering reasoning behind I don't know. One suggestion is that they acted as a "filler" to get the rods oil filled faster at start up to avoid oil starvation of the rocker arms. In the case with the WW extenders we run into a problem with the wood. They have a smaller inner diameter than the rod itself, thus the wooden chop sticks in the push rod won't fit. I solved that by simply removing the wooden chop sticks. Late 30/36 hp engines did not have chop sticks*and still had the same oil pump, so I think it is safe to run without the wood. Especially if I chose to run a slightly larger oil pump from the 1966-67 type 1 engine. *The most common push rod type are the ones with chop sticks (111 109 301). They are the only ones mentioned in my 1961 part book. In a later edition only 111 109 301A are mentioned for the 30/36 hp engine. From that I conclude the change to non-chop-stick push rods were made 1961 or later and that only type 111 standard beetles and spare part engines got them. The newer type has slightly smaller diameter of the rods, but the change is so small that it shouldn't really matter.